Description: Erect, usually few-branched shrub to 4 m high; branchlets floccose. Leaves elliptic to narrow-ovate, 7.5–27 cm long, usually 2–5 cm wide; apex acute to acuminate; margins entire; upper surface smooth, light green, not shiny; lower surface floccose, midvein and lateral veins evident in relief through the hairs; petiole 10–25 (rarely to 30) mm long. Inflorescence up to 70 cm long, usually floccose throughout. Petals white to cream, not reflexed. 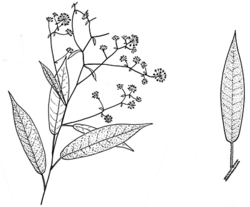 Distribution and occurrence: Grows in dry sclerophyll woodland or forest on sandstone, in the Sydney region extending inland to Springwood area.